ECB is short for the European Central Bank. Since 1 january 1999, the ECB is responsible for monetary policy in the Eurozone. The primary objective of the ECB is to keep inflation low (target is below 2%). The American counterpart of the ECB is The FED, the Central Banking System of the US. Click here for current interest rates of a large number of central banks. In the Eurozone there are several interest rates which are set by the ECB. 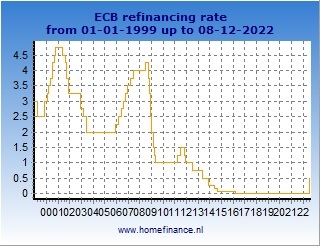 The most important interest rate set by the ECB is the main refinancing rate or minimum bid rate. The refinancing rate is the rate at which the ECB lends money to commercial financial institutions like banks. By changing this interest rate, the ECB can influence the interest rates on the money en capital markets like Euribor and Eonia. Indirectly, by changing the interest rates, the ECB can influence inflation. When the ECB announces an ECB interest rate cut or an ECB interest rate rise, most of the time the refinancing rate is meant. In the table and graph bellow, you can find the current ECB refinancing rate and the historical changes of the ECB refinancing rate.